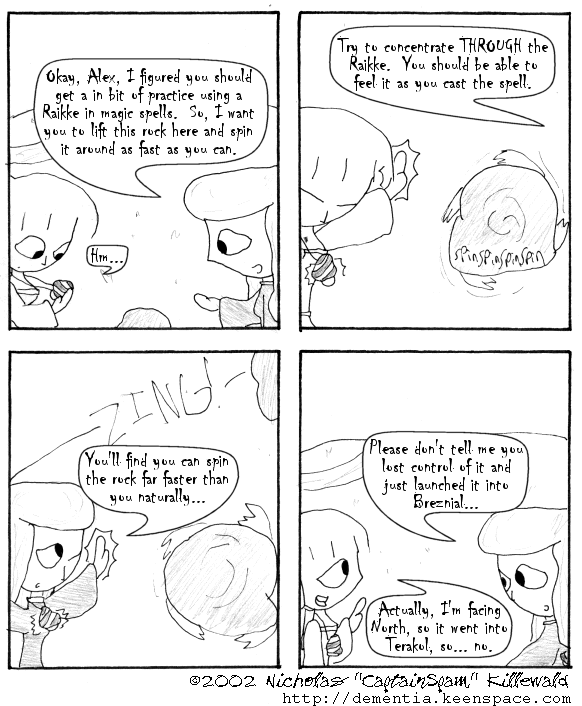 Some readers may note that Howard utilized a Raikke in a previous comic by eating it instead of wearing it as a pendant as Alex and Salth are doing here. The usage of Raikkes vary depending on exactly what's being done with them. Some spells require them to be eaten, others require them as an ingredient for a potion or similar, still others just require their magic properties to be tapped, shriveling them in the process. There are many different ways they can be used. Other readers may note that because the rock Alex was spinning presumably wasn't touching anything when she lost control of it, there would be nothing for it to propel from to launch it in such a manner, assuming that the rotational force applied to it came from all directions simulaneously (the closest approximation to the force applied via magic sources, given magic does not generally follow traditional physics) and was stopped when Alex lost concentration on it. To such readers, I implore you to shut up.